Busan, South Korea’s second-largest city, is known as a summertime destination — seafood, beaches, that kind of thing. 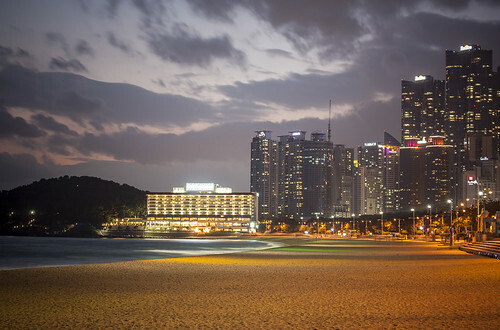 Dozens of love hotels dot beachfront neighbourhoods like Gwangan and Haeundae, geared towards couples looking for a sultry oceanside tryst. But I was there in December, just as the city was sliding headlong into winter. 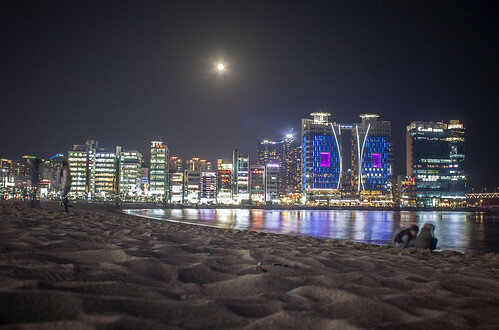 Busan’s climate is much milder than that of Seoul, but it’s still chilly, and when a stiff wind blows in off the Sea of Japan, the beach is not the first destination that comes to mind. Yet even on a windy winter evening, there are still people at the beach. 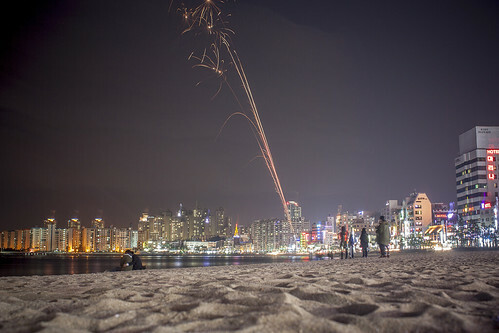 That’s because, along with swimming and sunbathing, one of Busan’s favourite seaside activities is setting off fireworks — which is exactly what a few hardy people were doing on an otherwise quiet Friday night at Gwangalli Beach, the city’s most popular stretch of sand. Top, Gwangalli Beach. Below, Haeundae Beach. 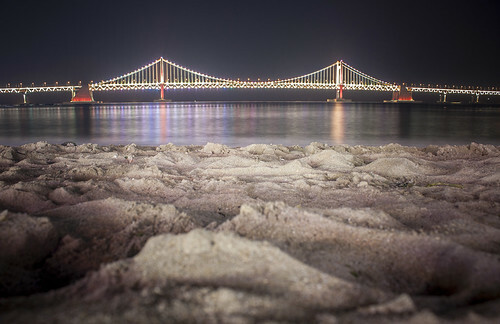 This entry was written by Christopher DeWolf , posted on Sunday April 28 2013at 04:04 am , filed under Asia Pacific, Public Space and tagged Beaches, Busan, Exploring the City, Korea, Streetlife . Bookmark the permalink . Post a comment below or leave a trackback: Trackback URL.